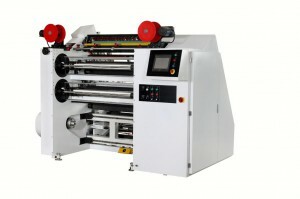 TTR Ribbon Slitter from Advanced Converting Equipment Ltd.
Wax Ribbon – A thermal transfer ribbon which is coated with a wax based ink formulation. Wax ribbons can be manufactured with a hot melt process or a solvent-based process. Wax ribbons are best for coated and un-coated paper stocks. Wax ribbons will print at higher speeds and lower temperatures than mid-range or resin ribbons. Mid-range Ribbon – A thermal transfer ribbon that is coated with a combination of wax and resin ink formulations. Mid-range ribbons offer more durable print than wax ribbons. They offer superior scratch and abrasion resistance when compared to wax ribbons but less than that of a full resin ribbon. Mid-range ribbons print on paper and synthetic labels. Resin Ribbon – A thermal transfer ribbon which is manufactured with a pure resin coating. Resin ribbons create the most durable image and they withstand heat and most chemicals. They must image at slower speeds and higher temperatures. Resin ribbons have the highest degree of scratch, smudge and abrasion resistance. The best print results are on synthetic stocks. Back coating – coating that provides heat protection, lubrication and static resistance to lengthen print head life. The back coating comes in direct contact with the print head. Coated Side In (CSI) – indicates that the ink is coated on the inside of the ribbon’s film carrier. Coated Side Out (CSO) – indicates that the ink is coated on the outside of the ribbon’s film carrier. Leader Tape – uncoated film found at the beginning of a roll of ribbon. It is used for product identification and it protects the ribbon from being damaged. Most leaders are coloured film. Trailer Tape – uncoated portion of ribbon found at the end of a thermal transfer ribbon. The trailer sends a signal to the printer that the ribbon is out. Some printers use a silver trailer that uses reflectivity as a sensor. Others use a clear tape or no tape to the core.